The PD15 power distribution card is a break-out card which makes it easy to control, protect, and distribute power from a battery. The PD15 card gives you all the nice-to-have features you would want to help manage power on your robot or automation setup. It can handle up to 15 amps and has a fuse to limit the maximum current. 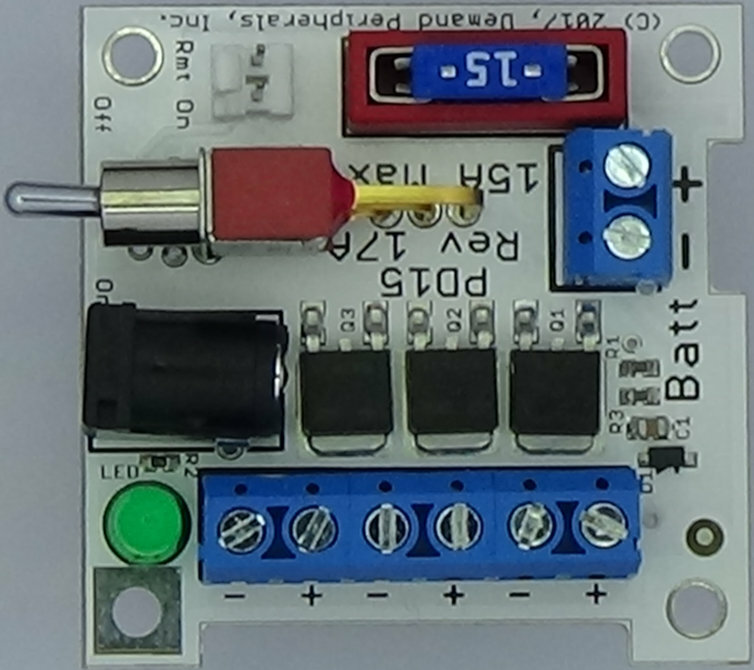 The card uses an ATO blade style automotive so you can easily set what maximum current you want. The PD15 provides a low current on/off switch which in turn controls three 20-amp AOD409 PMOS FETs. The FETs act as a kind of power relay for the card and using PMOS FETs lets the card switch the "high side" of the battery. Switching the high side of the battery input means that battery ground can be ground through your whole system. A two terminal input lets you control the device remotely. This is handy for switches that have to be mounted away from the card and for timed on/off using a real-time clock card. Power output is on three mechanically secure and easy to use screw terminals. Each screw terminal can handle at most 15 amps and the sum of all the currents through the screw terminals should not exceed 15 amps or the fuse value. Battery charging is made easy by the inclusion of a 5.5 mm barrel connector that is tied directly to the battery. Current into this connector should not exceed 2 amps. The schematic and layout of the PD15 are shown below. 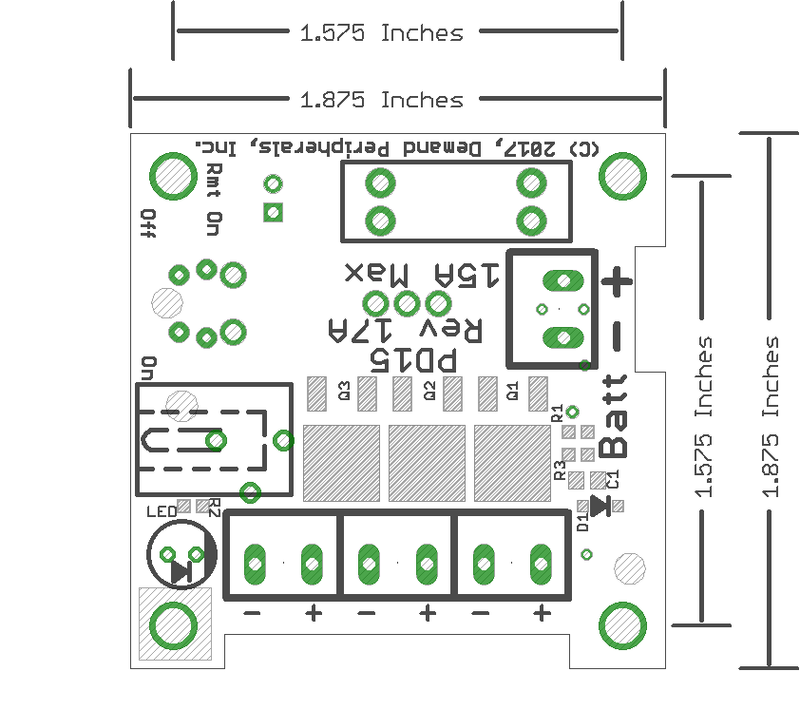 The Eagle schematic and board files are available here: pd15.sch and pd15.brd. The bill-of-materials is available here: pd15.txt.